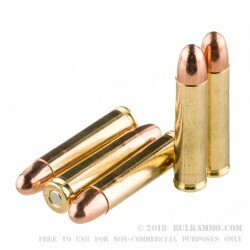 Sellier and Bellot .30 Carbine ammunition is topped with a 110-grain bullet that is encased by a copper jacket and features a solid lead core. 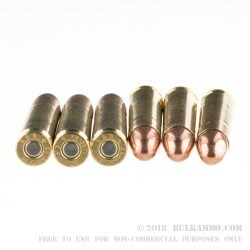 These rounds are of the FMJ or Full Metal Jacket type and are loaded into high polished, heavy duty, reloadable, Boxer-primed, new yellow brass cases. They have an impressive muzzle velocity of 1991-feet per second, and a hard-hitting 965-ft pounds of muzzle energy. 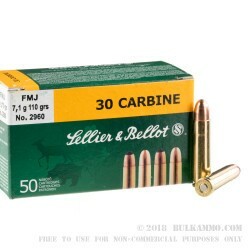 These loads come in a box of 50 rounds that are perfectly suited for shooting at the range, testing a new .30 Carbine build, or taking a day out plinking with the family. Get yours now. 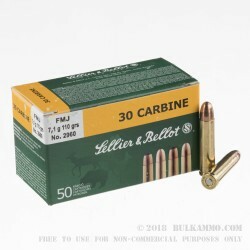 The .30 carbine cartridge was designed in 1940 by Winchester and quickly gained a following in the US Military for its small size and decent stopping power. The 30 Carbine was designed specifically to give rear guard troops a lightweight rifle that could provide those soldiers with more firepower than the 1911s they had been carrying. The military required that it weighed half as much or less than the Thompson Submachine Gun or M1 Garand. The M1 Carbine was also followed up by the M2 Carbine which debuted a little later in World War 2. The M2 Carbine uses the same rounds and its basically the same rifle, but it adds select-fire capability and a 30-round magazine. Although the M1 Carbine and its .30 caliber cartridge are a capable combination, it was never meant to be carried by forward troop units.